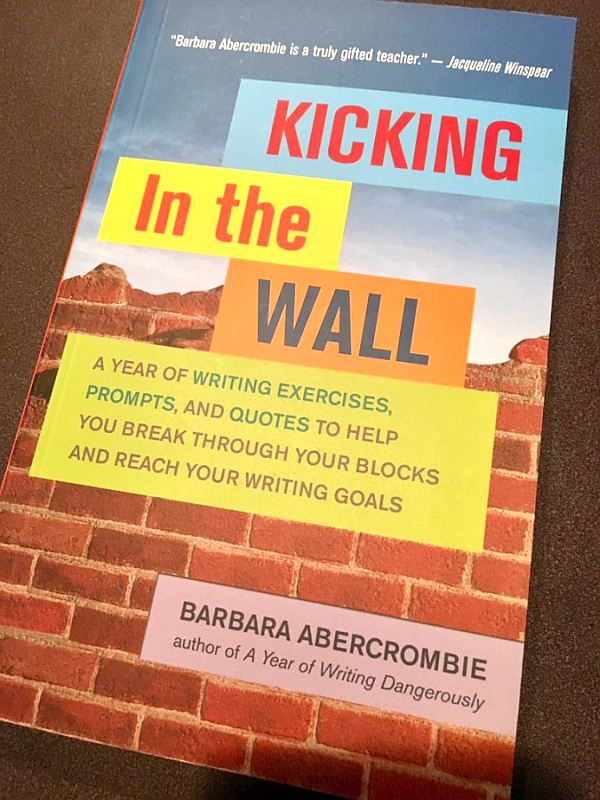 Kicking in the Wall by Barbara AbercrombieMy husband, daughters, and I once attended a major league baseball game. Being a baseball-loving family, it was a day we’ll never forget. Enjoying all delicious nine innings was easy, standing and clapping were easy… heck, even over-paying for Cokes and snacks was easy. The only difficult part of the process was finding our way into the stadium! Each door seemed to recommend another door and we found ourselves in a maze with thousands of other baseball fans. Once we were in the door, we became one with the flow of other fans and we all found our seats. After that, it was all good. In fact, very good. I often think about that day when I’m staring at a blank screen or sheet of paper. When it comes to writing, finding the way IN is over half the battle. Once you’re in the door, you get in the flow and… with any luck.. it’s all good! Writing prompts can be one of a writer’s best friends – right up there with coffee in fact. Kicking in the Wall is my new favorite writing prompts book and if you are a writer, author (any genre), and/or blogger, you’ll definitely want to add this book to your library. “I would go as far as I could and hit a wall,” said musician and memoirist Patti Smith. In response, playwright Sam Shepard advised, “When you hit a wall, just kick it in.” Writing teacher Barbara Abercrombie’s powerful writing prompts give us just the push we need to do it. Like a workout with a top trainer, her exercises warm up, stretch, and build creative muscle. Kicking In the Wall includes quotes from famous writers to accompany the exercises, as well as real-world examples of completed exercises by the author’s students in the UCLA Extension Writer’s Program. Though Abercrombie says readers need only commit to five minutes per exercise, she writes, “I’ve seen novels, memoirs, and many essays get started in those five minutes, and a lot ended up being published.” Her playful method is essential fuel for writers trying to get off the starting block, persevere through challenges, and cross their personal creativity finish lines. I not at all surprised she has this effect on her readers. Not only is she an author, she teaches at the UCLA Extension Writer’s Program. Is it any wonder her books have such a profound effect on me?! See Kicking in the Wall for more information.